Cylinders: 2.5L I4 16V GDI DOHC - 4 cyl. On sale now! This vehicle was originally listed at $22900. We've marked it down to $18888. You save $4012. 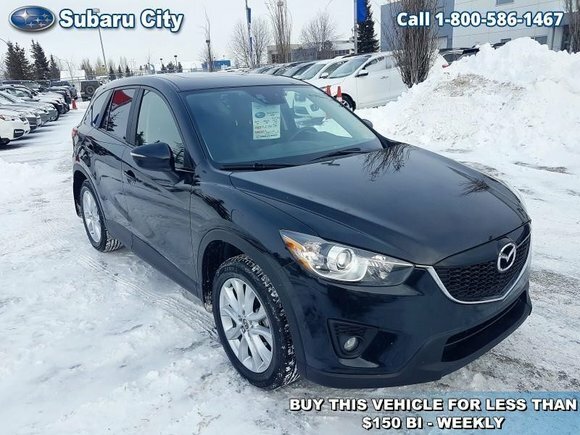 This 2015 Mazda CX-5 is for sale today in Edmonton. The 2015 Mazda CX-5 is a small crossover SUV that is big on style, function and features. The CX-5 offers great fuel economy, great safety ratings and a roomy, comfortable interior that makes it perfect for the family on the go. If you are not ready to give up performance for more passenger room, the CX-5 should be on the top of your list.This SUV has 127818 kms. It's jet black mica in colour. It has an automatic transmission and is powered by a 2.5L I4 16V GDI DOHC engine. This vehicle has been upgraded with the following features: Leather Seats, Sunroof, Rear View Camera, Bluetooth, Premium Sound Package, Blind Spot Detection, Fog Lamps. Buy this vehicle now for the lowest bi-weekly payment of $125.21 with $2066 down for 84 months @ 5.99% APR O.A.C. ( taxes included, $790 Administration and Secure Ride included / Total cost of borrowing $4191 ). See dealer for details. Want to try the 2015 Mazda CX-5 GT?